The deets: embellished bag; ring; bangle; coin purse; satchel; pink case; blue case; watch; flats. Last weekend I spent the afternoon with my boyfriend at the local mall shopping for a gift for a friend. After no luck at Nordstrom I casually walked into Kate Spade. Once we were in, I literally stopped in my tracks and gasped out loud when I made eye contact with all the insanely cute kitty stuff they have out right now. I ran right over to the wallet, proclaimed my love for it as my boyfriend stood there shaking his head in embarrassment. Next I pointed to the purse and squealed, then salivated over all of the jewelry. Basically, it was exactly like that scene in Charlie and the Chocolate Factory when the kids are escorted into the room made entirely of candy. I literally could hear the song "Pure Imagination" playing in my head as I ran my hands over the bedazzled cat ears. I immediately ordered the kitty ears ring & matching bangle. I couldn't resist! Am I a crazy cat lady? Yes. 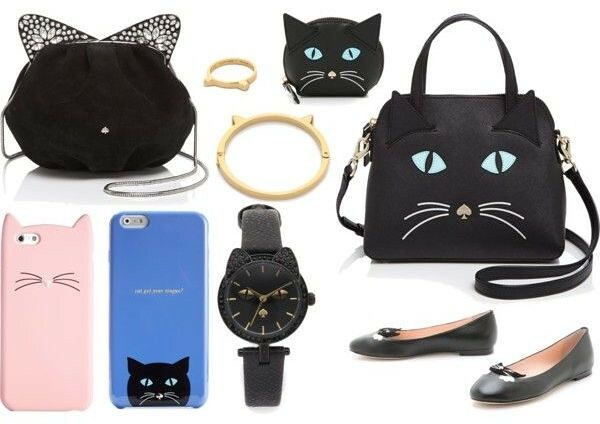 Does Kate Spade make it a tiiiiny bit less weird and a hair (get it, cat hair) more chic? I sure hope so.